After Accenture invented the term 4PL in the mid-90’s, the business model did not develop much in the following years. In the past few years however, everyone has been talking about 4PL and large parts of the cargo loading industry in Europe have started focusing on this type of outsourcing. Nevertheless, there are very few 4PL service providers around because established logistics companies do not have independent and free access to the market due to their assets and competitors, which means they cannot offer their clients individual best-in-class solutions. 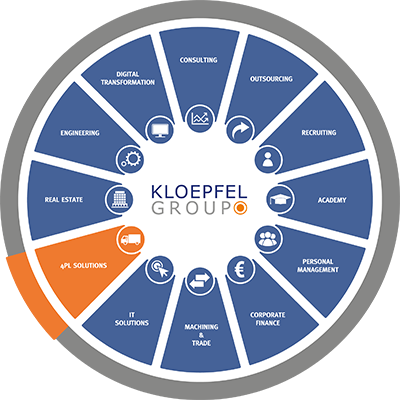 Because of this fact, Kloepfel 4PL Solutions was founded as part of Kloepfel Group’s general strategy to be able to offer their clients customized solutions in logistics and business process outsourcing (BPO). With Sebastian Krings and Gerald Floß as CEOs, the company has real 4PL experts on board who played an important role in shaping the 4PL initiative in Europe over the past few years. Their team includes experts from various divisions of the cargo loading industry but also from logistics service providers, with many years of experience which will help them professionally supervise a range of logistical issues. Why is the 4PL model relevant to you? By implementing the 4PL solution in your company, you can focus on your core business elements and leave the provision of the right logistics experts and the appropriate IT solution to your 4PL service provider – Kloepfel 4PL Solutions. We do not only identify logistics savings for you, but we also implement them sustainably with you!